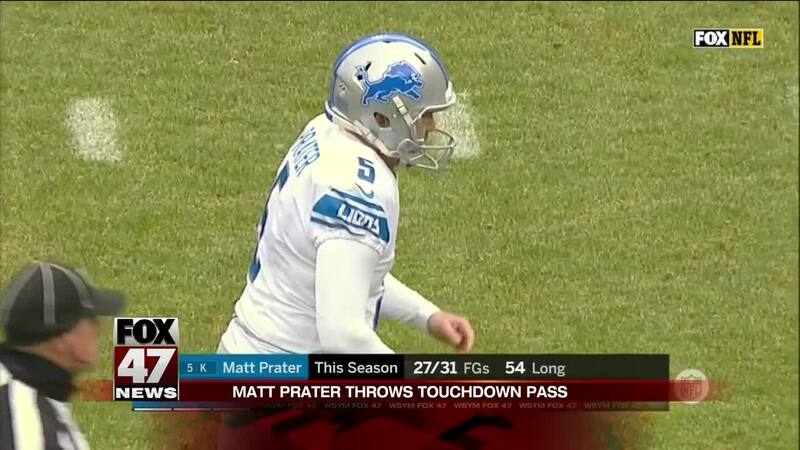 Matthew Stafford and kicker Matt Prater both threw touchdown passes and the Detroit Lions beat the Green Bay Packers 31-0 on Sunday. GREEN BAY, Wis. (AP) -- Matthew Stafford threw for 266 yards and two scores to T.J. Jones, kicker Matt Prater tossed a touchdown pass after faking a field-goal try and the Detroit Lions ended a beleaguered season on a high note with a 31-0 win over the Green Bay Packers on Sunday. With Green Bay trailing 21-0 at the half, quarterback Aaron Rodgers never returned after walking to the locker room early in the second quarter, having suffered a concussion. Both teams had long been eliminated from playoff contention. Zach Zenner had a 13-yard touchdown run for the Lions (6-10), who have won four straight against their NFC North rival for the first time since 1982-83. They got a little positive push at the end of Matt Patricia's first season as coach. "We take none of these games for granted," Stafford said. The passing game clicked despite a depleted receiving corps, with Kenny Golladay missing the relatively meaningless game with a chest injury. The Lions had decisive edges in total yards (261-67) and first downs (16-3) by halftime, with 11 of the first downs coming through the air. Zenner finished with 93 yards on 21 carries. Stafford was 20 of 32, while rookie Brandon Powell had six catches for 103 yards. Even Prater got into the act after taking a direct snap during a field-goal attempt, looking left and finding an open Levine Toilolo for an 8-yard touchdown and a 14-0 lead with 10:36 left in the second quarter. "Slow delivery, lollipop, but it was on target so that was a plus," Stafford joked about the play. To make matters worse for the Packers (6-9-1), Rodgers walked back to the locker room around the same time his teammates were getting over the shock of Detroit's trick play. It was unclear exactly when Rodgers got hurt, though he lost his helmet during a sack on his second play of the game. Rodgers, who played two more series before departing, was 3 of 5 for 26 yards. The Packers were also without receiver Davante Adams, who missed practice this week with a knee injury. Adams finished the season with 111 catches, one shy of tying the single-season franchise record set by Sterling Sharpe in 1993. Left tackle David Bakhtiari, who was dealing with a hip injury during the week, watched most of the second half from the sideline. "We didn't have any rhythm," interim coach Joe Philbin said. "Let's be honest: first three drives, three-and-outs ... couldn't get the run game going." Backup DeShone Kizer finished 16 of 35 for 132 yards, while Jamaal Williams managed just four yards on eight carries. Green Bay didn't top 100 yards in total offense until the third quarter. The Lions had the game well in hand by then, with Zenner making it 21-0 following his touchdown run late in the second quarter. There is a lot of uncertainty in Titletown following a second straight losing season and the firing of coach Mike McCarthy in early December. Philbin, the offensive coordinator, went 2-2 as interim coach. The Lions "outcoached us, they outplayed us. That being said, (I am) very appreciative of all the things they did all season," Philbin said about his postgame message to players.